Some people like to bet on baseball while others prefer to bet on basketball or hockey. But, by far, football (when in season), attracts more betting interest than any of the other major sports in the United States. Football season is less than a month old and there are already some big surprises. Did anyone expect both the Giants and Redskins to both be without a win after three games? How about the 3-0 Miami Dolphins and the 3-0 Kansas City Chiefs? It just goes to show you how hard it is to be a football handicapper. Betting on football (when in season) is almost as popular as watching the games just for fun. If you are serious about your wagers, you should seriously consider signing up with a professional sports handicapping service. While no reputable handicapper can guarantee his picks, you do stand a better chance of winning when you have a solid handicapping team on your side. 1. You get the most up-to-date information on teams and player injuries. Even the casual fan knows that when the star quarterback gets hurt, his team’s chances of winning go down. In the NFL, the league rules require each team to post an injury report prior to the upcoming game. The NFL’s justification for requiring this report is to allow the opponent the chance to plan their strategy based on who may or may not be playing. 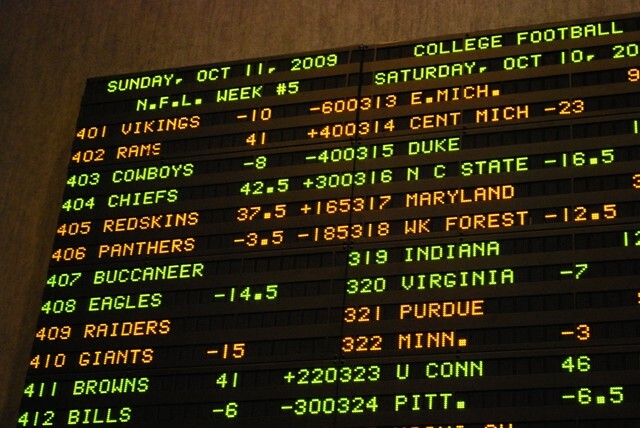 In gambling circles, injuries and other last-minute changes can have a big effect on the betting line, and ultimately, the outcome of the game. 2. You get a great analysis of historical trends. It would be pretty hard for the average football bettor to know that the visiting team, when playing on natural grass in the month of December, has covered the spread every time in the last five years. With information like that, from a handicapper that really does his research, you have a big advantage over another bettor who does not have that information. 3. You do not have to do the laborious research yourself. How tedious it would be to try to find out those odd, but important pieces of historical data. When you use a top-notch sports service to make your picks, it has the insight, research capabilities and experience to come up with some little known, but significant trends. 4. You get solid picks from experts in the field. Statistics show that most amateurs cannot consistently pick more than 50 percent of the winners against the spread. Professional football handicappers do much better as a whole. While a 75 percent win ratio is not very common, 60-70 percent is a realistic expectation for a great handicapper. 5. One winning bet can cover your costs for the entire season. Some people are hesitant to join the service because it will cost them a few bucks. Most quality handicapping services will offer some free picks and will let you try the program out for a while. If you are not happy, you can ask for a refund. However, all it takes is one winning bet to pay for your entire season’s subscription. Betting adds excitement to even the most lopsided game. If your team is trailing by 18 and needs to score a touchdown, so you can cover and win your bet, you will watch the game until the end. A small wager is enough to get your heart racing! Can the Braves Beat the Streaks?